The first order of business for this morning is to ship a box load of souvenirs back to my friends. It’s not doing me any good sitting in a box in the apartment so I might as well ship now. The post office is less than a block down the street, yet this little maneuver cost me a good 45 minutes that I can’t waste, ’cause we’re heading out to Tokyo Sky Tree! THe way this works is, you are issued a “timed ticket” which allows yo into the Sky Tree ticketing gate at only a certain time. Sadly, the timed passes that are being handed out are admitting us to the entry gate between 4:00 and 4:30, almost sundown just to get tickets! 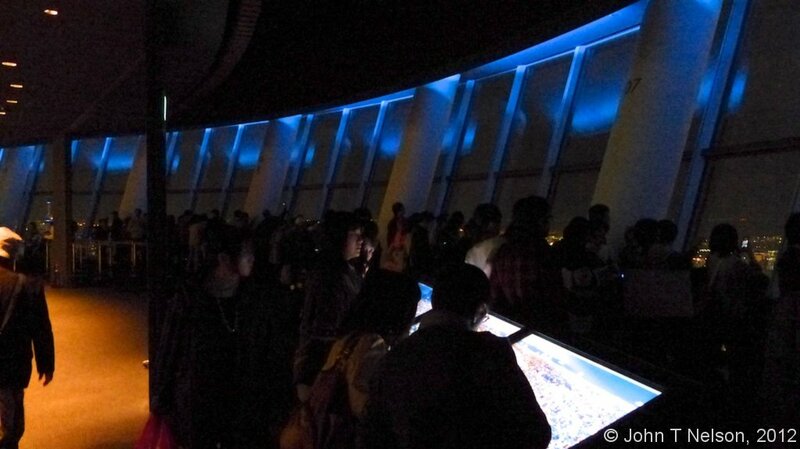 Well maybe we’ll get lucky and see the sunset from Sky Tree’s observation deck. The Fall is a horrible time to vacation in Japan, the days are way too short! 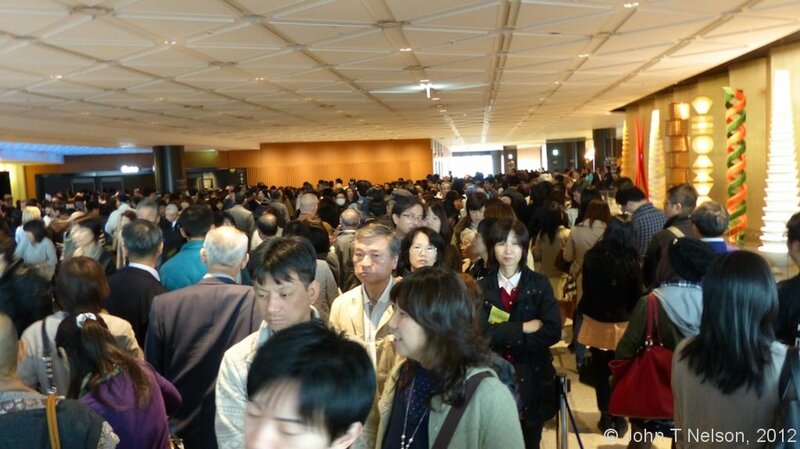 After picking up our admission passes, we proceed to kill 2 1/2 hours by souvenir shopping and taking photographs. Andrew takes a nap on the mezzanine level overlooking the sunset while I take photographs and make sure our ticketing is proper. He’s still feeling under the weather from a cold. The Disney store is playing Christmas tunes and it’s only mid-November. 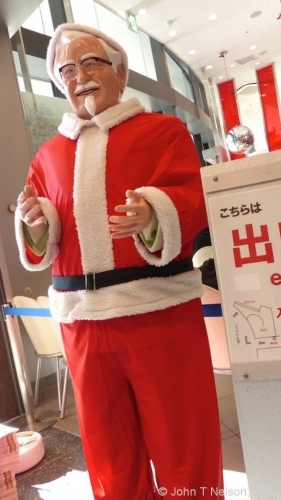 Also, The Colonel in front of the KFC has been dressed in a Santa suit and other stores are decorating for Christmas. It makes sense that they get such an early start, because the next holiday on the Japanese calendar is Christmas, unlike the United States where we celebrate Thanksgiving. Halloween decorations and related flummery were ripped down and long forgotten about five minutes after midnight, October 31st. I rouse Andrew from his sleep and suggest that we make our way towards the ticketing area so we can be first to hang over the observation deck railing some 634 meters over Tokyo. Andrew, who is acrophobic, is just thrilled. We manage to get pretty close to the head of the ticketing line, but are queued up behind the hundreds upon hundreds of other pass holders from earlier time slots. 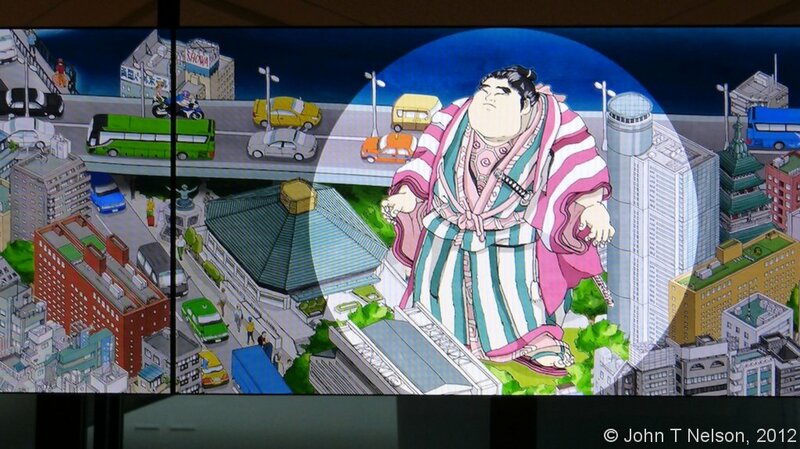 Yeah, there are switchbacks as far as the eye can see but there are also a few entertainments on the way: the animated map of Tokyo with its amuzing, historical references and playful, Sim City like styling. While waiting in line for Sky Tree tickets, the normally quiet and reserved Japanese people are quite talkative and almost boisterous. 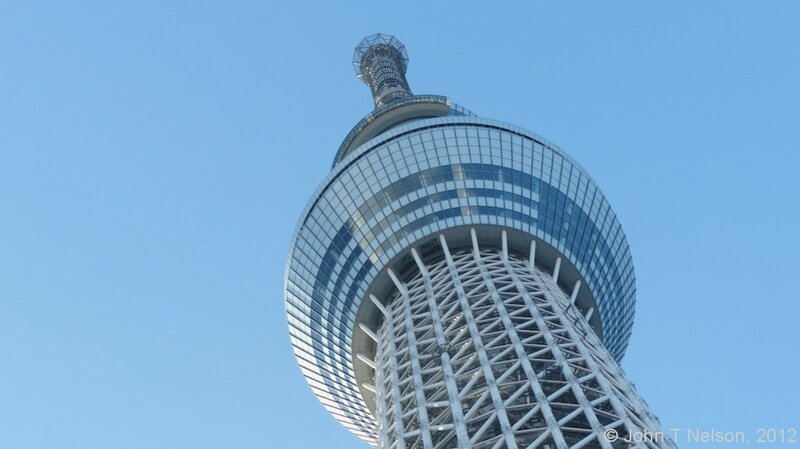 They are excited to ascend to the top of Sky Tree and enjoy this new achievement and symbol of Japanese industry. When the Japanese are quiet or loud seems to depend on the venue and the expectation of personal space. You could hear a pin drop among this same number of people in the streets at the Culture Day festival. We finally get our tickets (only Y2000) and wait in ANOTHER line for the Sky Tree Shuttle. We only have to wait 15 minutes for the shuttle and finally board our conveyance to the first observation deck, 350 meters above ground level. Although the shuttle is traveling at over five meters per second, the sense of movement and ascent is utterly imperceptible. And each of the four shuttles sports a different decoration theme, ours was bronze sakura blossoms. The shuttle door opens, revealing glass walls to the Tokyo skyline and oh is it lovely! 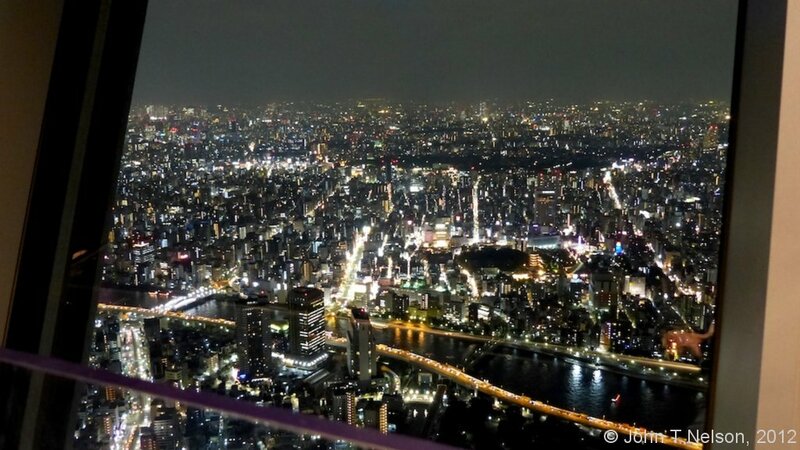 You can see the Sumidagawa, the Eitaibashi Bridge, Tokyo Tower, clusters of tall skyscrapers and the entire Tokyo sprawl from horizon to horizon! I missed the sunset by a half an hour but that’s ok, Tokyo at night is a fair consolation prize! 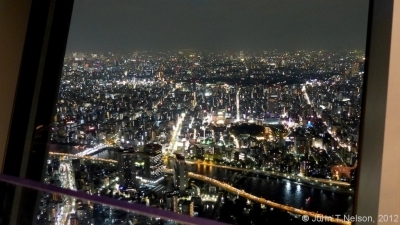 The height of this new tower is impressive, but to be honest, the view from twice the height of Tokyo Tower is not as mind-bending as you might imagine, unless youre already acrophobic. On the lower observation deck there is a gift shop, cafe and fancy restaurant called Musashi 634… oh, and the glass floor. 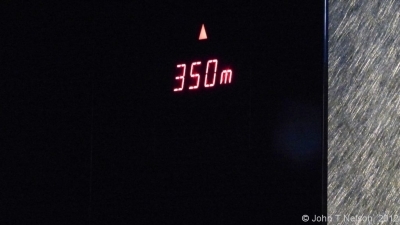 Yes, like Tokyo Tower, the designers of Sky Tree have provided us with a glass floor to jump around on and nothing else between us and the concrete 350 meters beneath our feet. The small children just love it! I watch and am pleased to see the baton passed from generation to generation. The many children happily playing on the observation deck. Their parents, proud to give them this new gift of industry and a new symbol of Japan’s future. The older retirees, proud of their country’s achievement and hard work. The elderly, confined to wheel chairs and looking out over the vast Tokyo skyline, no doubt remembering the early days of poverty and sacrifice, seeing their time come to an end and passing the country’s prosperity on to the next generation. 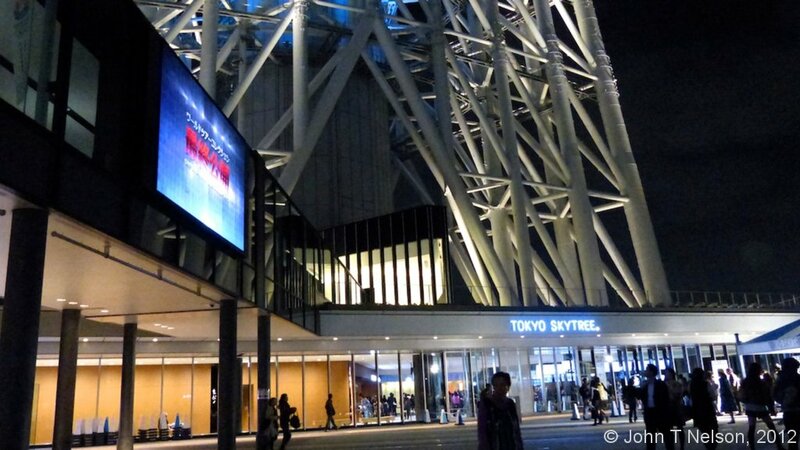 There’s one more height to conquer and that is Sky Tree’s Tembo Galleria, the upper observation deck. 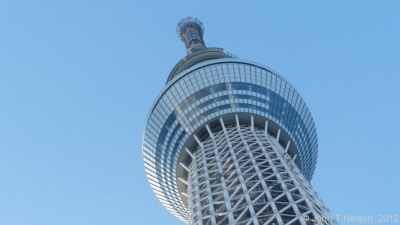 Again, like Tokyo Tower, this is a special observation deck for brave individuals who want to see Tokyo from an even greater height, but with a twist… literally. 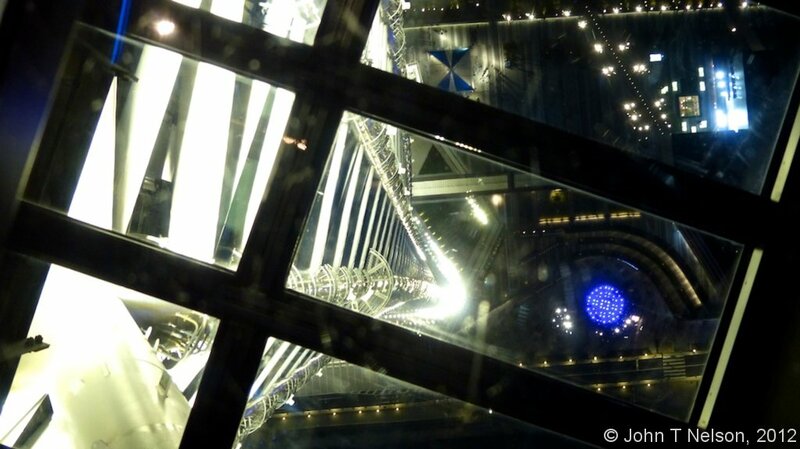 The Tembo Galleria is a transparent tube that spirals around the exterior of Sky Tree at a height of 451 meters and the highest point open to the public. Andrew passes on the Tembo Galleria and frankly, I want to see Tokyo from the Tembo Galleria in the broad daylight so we make our way back to Sky Tree’s central core shuttles for the smooth and effortless descent to the Solamachi plaza below. Andrew is kissing the foundation of Terra Firma, while I’m looking forward to a repeat visit and the Tembo Galleria on a sunny day! After the descent from our communion with the gods (and I wonder if there is a shrine on one of the Sky Tree observation decks), we select one of the many fine restaurants on Solamachi’s 6th floor. There’s a line waiting to get into this one so we queue up on one of the benches lined up outside the restaurant. This is always fun to watch as diners are admitted to the restaurant, and everyone moves over by a couple places on the bench. We’re seated in 15 minutes. I would say that its a popular place but every place in Solamachi seems to be high quality and popular. Chowing down on EXCELLENT Nikku Udon soup, slightly sweet and awesomely satisfying. 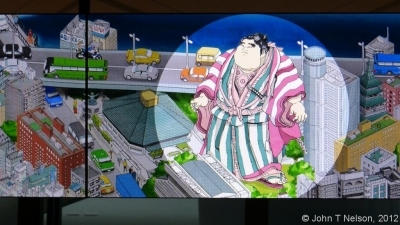 We discuss plans for this weekend’s “Design Festa” held at Tokyo Big Sight. I’ve always wanted to attend a game fair or toy show or design and culture exhibition at Big Sight, so tomorrow is my chance!